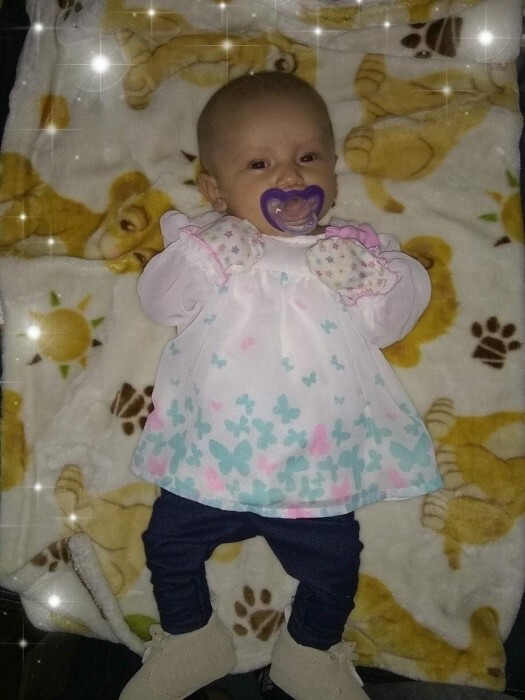 Baby Migizi Marie White, 4 months old, of the Eagle Clan and Redby, Minnesota began her journey to the spirit world on Tuesday, September 11, 2018 from her home. She was born on May 14, 2018 in Bemidji, MN, the daughter of Brittney Swanson and Richard White, Sr.
Migizi was always happy and loved to smile at everyone. She loved spending time with her parents, brothers, family and friends. She liked going to powwows and listening to the music. Migizi was very curious and interested in everything and everyone. She left us much too soon and we will miss her very much. Family that she is united with are her grandma; Shirley Jean White, aunties; Delainey and Jacinda Kingbird, uncle; Tim Swanson, great grandparents; Bertha and Allen Kingbird, Jr., great uncle; Patrick Block, great great grandparents; Audrey and Samuel Z. White. Those she leaves behind are her parents; Brittney Swanson and Richard White, Sr. of Ponemah, brothers; TyRese, Richard, Jr., Nathan, Emmett and NeheMiah, aunties; Salina and Collette Kingbird, Miranda Hurd and Megan Swanson, uncles; Matthew Sr. and Randall White, Sr., Eric Swanson, Jr. and William Swanson, grandparents; Leslie and Eric Swanson, Sr. and Richard Allen Kingbird, special great grandma; Virginia Spears, great grandparents; Patricia and Eric Swanson, Patricia and Clifford Block and Leroy White, Sr., great aunties; LeeAnn and Becky White and LuAnn Smith, great uncle; Terry Smith and many cousins. A wake for Baby Migizi will begin at 5:00 p.m., Friday, September 14th and will continue until her 10:00 a.m. traditional service on Sunday, September 16th all being held at the Boys and Girls Club in Ponemah, MN. Waa-maajaa’iwed is Steve Jackson. Pallbearers for Baby Migizi will be Eric Swanson, Sr. and Matthew White, Sr. Alternate pallbearers are Eric Swanson, Jr., Andrew Spears, Sr. and Nicholas Spears. Interment will be in the White Family Burial Grounds at Ponemah, MN following her services.